The Park Guell is a public park system composed of gardens and architectonic elements located on Carmel Hill, in Barcelona, Catalonia (Spain). Carmel Hill belongs to the mountain range of Collserola – the Parc del Carmel is located on the northern face. Material this time served as natural hills, and not bricks. Details of the buildings are distinguished by bizarre shapes and bright colors, perfectly fitting into the surrounding landscape. Park Guell had to be built on a rocky surface, and the only difficulty was the lack of water, but Gaudi was able to solve this question. At first glance, because of its high terrain, this site was not very suitable for building an English park, but having submitted to the conditions of nature, Gaudi created multi-level platforms, tunnels and streets. Park Güell is located in La Salut, a neighborhood in the Gràcia district of Barcelona. 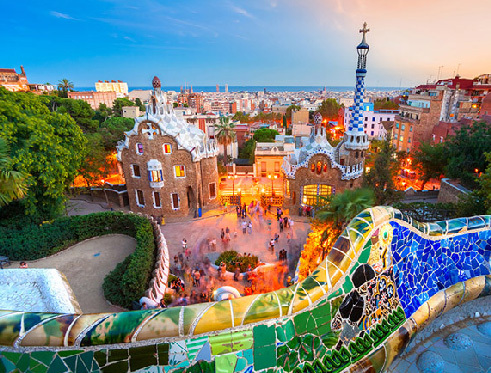 With urbanization in mind, Eusebi Guell assigned the design of the top park to Antoni Gaudí, a renowned architect and the face of Catalan modernism. Gaudi created stunning scenery, buying cheap, but very practical material. In the course of the construction of the Park Güell, gravel, broken ceramic tiles and even various industrial wastes were actively used. The construction of the Park Güell can be divided into several stages. In the beginning was the preparation of the construction site, then the access roads to the park were prepared and reinforced. The first buildings in the Park Güell were the walls and entrance pavilions. Park Güell is the reflection of Gaudí’s artistic plenitude, which belongs to his naturalist phase (first decade of the 20th century). During this period, the architect perfected his personal style through inspiration from organic shapes. He put into practice a series of new structural solutions rooted in the analysis of geometry. 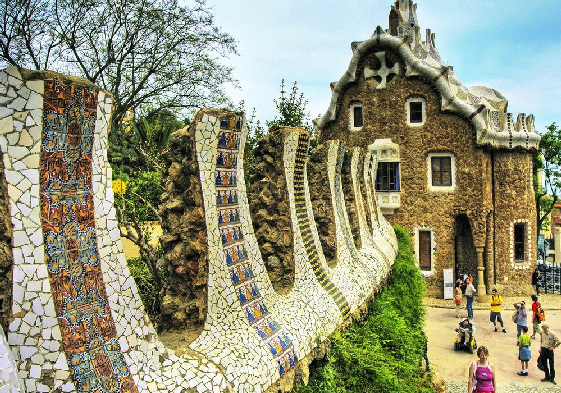 Even with the use of very simple and cheap materials in the construction of the Park Güell, the architect received tremendous results. The buildings look very solid and seem to be built from a single material. 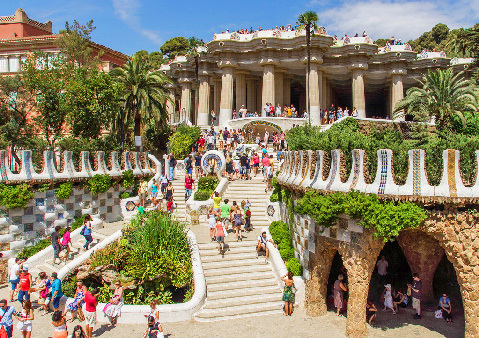 In the Park Güell, a colonnade of the market was built, so that future residents of the district had a place for gathering and leisure. Also, one residential house was built as an example for a future buyer. And finally, at the final stage a quirky, winding bench was constructed. To that, the Catalan artist adds creative liberty and an imaginative, ornamental creation. Starting from a sort of baroquism, his works acquire a structural richness of forms and volumes, free of the rational rigidity or any sort of classic premises.